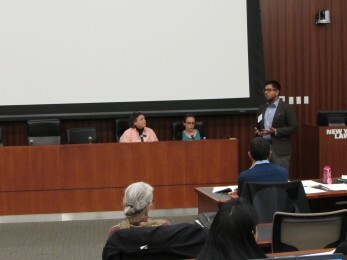 On December 1, 2015, Safe Passage welcomed adjudicators from the Newark Asylum Office and advocates to discuss “Best Practices in Representing Immigrant Youth Before the Asylum Office.” Moderated by Professor Lenni B. Benson, Director of the Safe Passage Project, the panel commenced with Claire R. Thomas, Safe Passage’s Director of Training, discussing preparing asylum cases for young people. Next, Heather Axford, Senior Staff Attorney at Central American Legal Assistance (CALA), led participants through identifying nexus in asylum claims through immigrant youth. Adjudicators from the Newark Asylum Office: Brooke Kelly, Supervisory Asylum Officer; Sunil Varghese, Deputy Director; and Lauren Vitiello, Training Officer, engaged participants in discussing supporting documentation, minor-specific interviewing techniques and considerations, managing the presence of third parties, and what to do (and not to do) as an advocate. 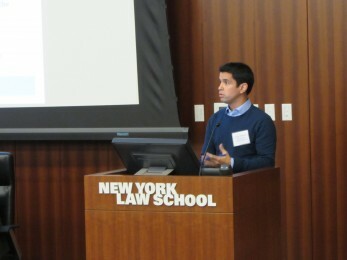 Following, Ernie Collette, Staff Attorney at MFY Legal Services, Inc. and pro bono attorney with the Safe Passage Project, provided information on access to public benefits for immigrant youth. 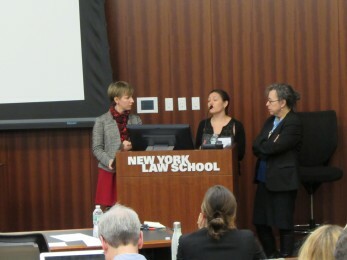 Lenni Benson and Claire R. Thomas then engaged participants in a question and answer period. Safe Passage extends a special thank you to the Newark Asylum Office, Heather Axford, and Ernie Collette for their time and efforts in preparing this incredibly informative presentation. Please see Safe Passage’s website under “resources” and then “asylum” for links to Claire and Heather’s powerpoint presentations, as well as “benefits” for the link to Ernie’s charts on public benefit eligibility.